Visit the home page for Peachtree Park’s new website (www.peachtreeparkatl.org) to get a breathtaking view of our “Island in the City”. What you are struck with is the beautiful tree cover; houses and streets are barely visible. These trees are important to us all, especially wildlife. See our page Learn About Trees to find out more about the value of our urban forest. Historically Peachtree Park has compared well to the rest of the city with respect to our tree cover. Georgia Tech’s 2008 canopy study reports that there is 55% canopy coverage for Peachtree Park compared to 48% coverage for the entire City of Atlanta proper. The following canopy data for Peachtree Park is from Georgia Tech’s 2008 Urban Canopy Study and was compiled for us by Christina Gibson, Canopy Conservation Coordinator with Trees Atlanta. Makes up 60.8% of the city’s total land area. Make up 4.5% of the city’s total land area. Atlanta’s mayor is so concerned that he has directed that there will be no net loss of the city’s canopy. And in Peachtree Park we are equally concerned because trees, and therefore our canopy, is disappearing at an alarming rate. Not just a tree or two here and there, but the canopy. A new Urban Canopy Study for 2014 is due to be published soon and we’ll see how we’ve done in the last six years. The irony is that one of the major attractions of Peachtree Park is its tree canopy, and it is the very thing we are losing. Increased development and building houses too big for a lot is the biggest factor in the reduction of our canopy. For example, thirty-five large trees and countless smaller ones were removed in one month in 2016 by developers from just 2 lots (see our post No habitat, No Wildlife). And there were other lots where the damage was just as great. There are valid reasons to remove a tree that is still standing. Sometimes it’s unavoidable because a tree is dead, dying, leaning or has been severely damaged. Sometimes a tree is in the way of renovation or construction, and can be removed legally. Whatever the reason for removing a tree, the City of Atlanta says you must have a permit if the tree is greater than six inches in Diameter at Breast Height (DBH). DBH is measured 4 1/2 feet from the ground. If you read the ordinance there are exceptions, but generally that’s the rule. The city has the ability to levy severe fines if a tree is taken down without a permit when it should have been permitted. Of course common sense must prevail in situations where danger is imminent. If a storm comes through and puts a tree in a position to potentially fall and cause damage to your property or do harm to people, then deal with it immediately. Most reputable tree services know how to help you document the situation and take immediate action. Fly-by-night tree services sometimes canvas the neighborhood knocking on doors. They tell you that a tree on your property should be removed for a variety of reasons: It’s too close to the house and may fall and crush your children, It’s dead or leaning and about to fall, big limbs overhang your house and are a threat, and on and on. Be careful! Not only do they charge a big fee to do the work, but you may wind up facing stiff fines from the city for cutting down an un-permitted tree. If one of these services comes to you, get business cards, phone numbers, and photos of the truck. Then pass the information along to the city arborist division. These companies are a big problem city-wide and the city will follow up. Fortunately, a lot. We’ve learned that while appealing tree removal is sometimes necessary, the issue must also be addressed at a higher level. The Peachtree Park Civic association is very concerned and has formed a Tree Committee to work on the problem. A major focus is education and working to change the law in favor of stronger tree protection. The City of Atlanta is concerned too – losing our tree canopy to development would be a black eye to the administration. 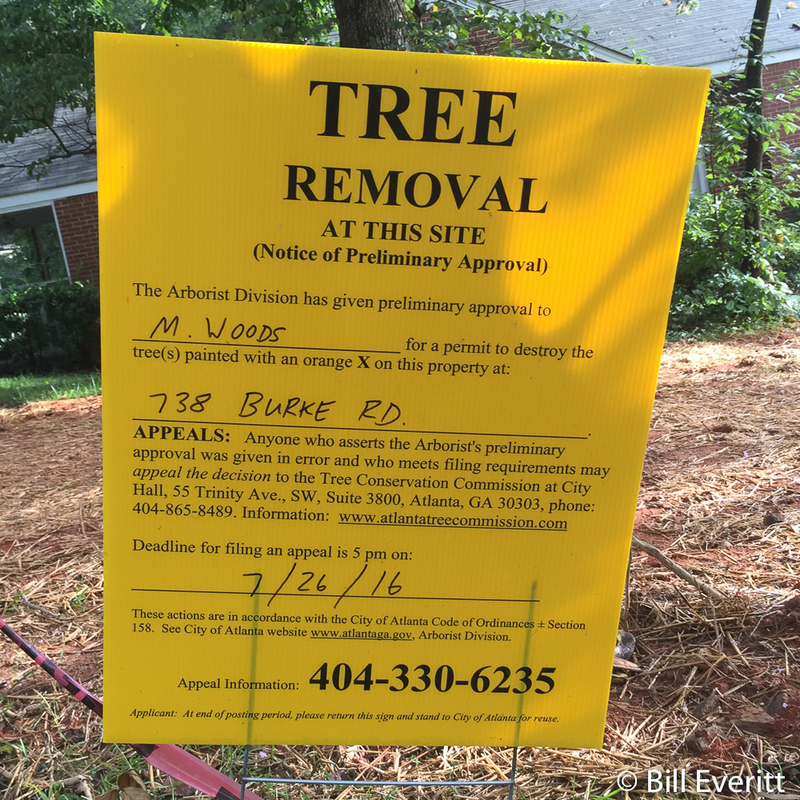 To that end the Atlanta Tree Commission has been tasked with re-writing the current ordinance to give more clout to tree protection. Just because a chain saw is running doesn’t necessarily mean the whole tree is being taken down. Up to 20% of a tree’s canopy can be trimmed without a permit. However, if you believe a tree is being removed that should not be, please consider taking these actions. Be alert to orange and yellow signs in front of a house which are required public notices that trees might be removed. Orange signs appear first indicating preliminary approval by the City arborist. These must say up a minimum of 10 days. Yellow signs appear next indicating final approval. At this point trees to be removed will have been marked with a big orange ‘X’. Report tree services you believe may be canvassing the neighborhood as described above. If you see people taking down a tree, talk to the tree company, contractor or homeowner and ask if they have a permit from the City of Atlanta to remove the trees. Ask to see the permit. If a permit can be produced, then legally the trees can be removed. 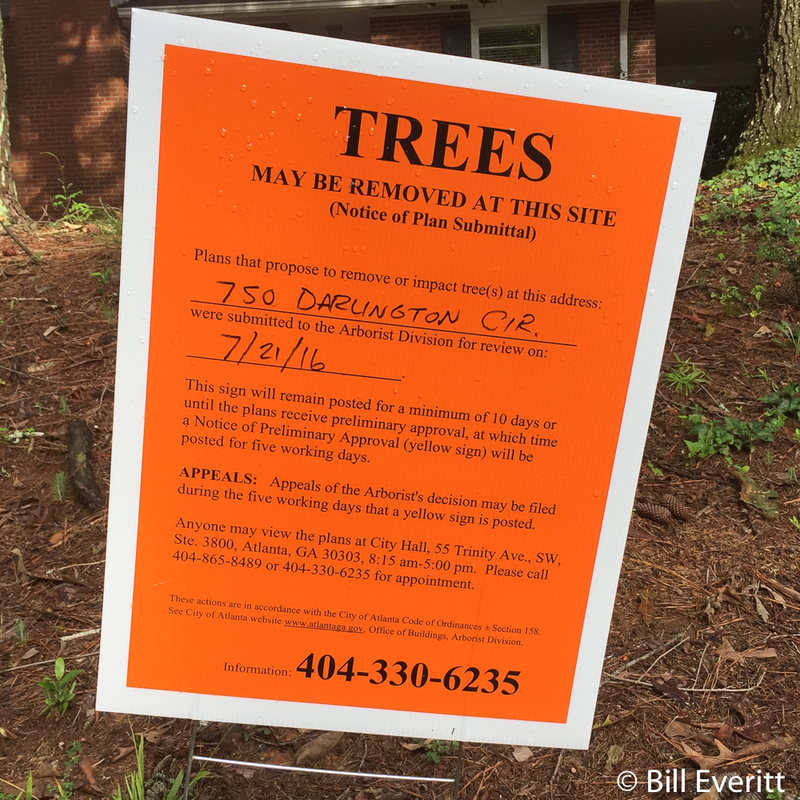 Call the City of Atlanta’s Arborist Division (404) 330-6874, give them the address and ask if there is a valid permit for removal of the trees. If a permit has been issued, then the trees can be removed. 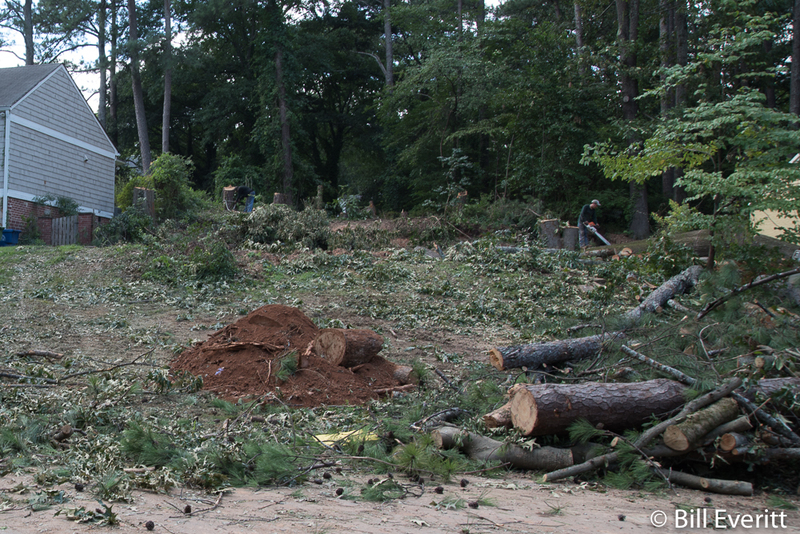 If a permit has not been issued and the removal work continues, call 911. If you cannot reach the City Arborist Division, Call 911. This may seem like it’s over the top, but the police are responsible for code enforcement and tree protection is part of their job. It will also be necessary if it’s outside the normal work week hours for the Arborist department. Nobody wants to be confrontational or a vigilante, but once a tree is gone, it’s gone forever. Please help save a tree if you think that it’s being removed illegally.